The team must come to terms with the consequences of their actions; and someone claiming to be from Black Badge Division arrives in Purgatory. 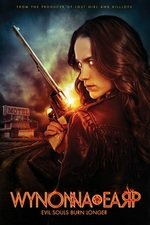 Den of Geek - The Wynonna Earp family grieves their absent loved one with whiskey, tears, and a commitment to keep on living. Arguments about killing Dolls aside, as someone dealing with grief, this episode really resonated with me. A chunk of the interpersonal conflict was everyone trying to figure out what they were feeling and what to do about it, and what to do if there was nothing to be done...and how all those different reactions went ricocheting off each other. Where do you put the anger? Where do you out the loss, when the loss is much larger than you can handle? How do you help someone else with the loss? For me, this ep is up there in the same territory as "The Body" (Buffy tVS), but maybe that's just because of where I am. And now we've got a new POC love interest as the third point of the Wynonna/Doc triangle, and seeing as how she's a vampire and an obstacle to the OTP, her prospects of surviving the series seem dim. Sigh. Oh, hey, Mogur just noticed now that we cross-posted (in case it seemed like my Whedonverse comment was a direct response/dismissive of you). As much as I am an embittered ex-Whedon fan, I do remember how incredibly affecting "The Body" was. But I think the strength of that episode is directly responsible for how un-affecting most all future Whedonverse deaths felt to me. I figured that's what happened. Not a problem at all - I suspect that if I hadn't been the absolute perfect candidate for "Colder Weather", I might have had several problems with it, too. From that interview, I find I approve of Andras's thoughtfulness and intentions, but I don't think the episode was better than mediocre. That's okay, though, because this show is comfort food for me; I don't expect that much from it. ... though the altered theme song was an inspired choice. That was great. I have a perspective that tries to incorporate the business side of making TV so to me the only explanation that is necessary is that they did it because the actor asked to be written off the show. In other words, this was not a Jossing. The character wasn't just killed for creative reasons to raise stakes. I think Andras and crew were in a real bind because fans would not accept plots where Dolls had to suddenly leave on a mission of some sort and then just never be seen again. The fan base is too savvy and engaged to think he would leave Wynonna behind and then just send an postcard sometimes. Especially after they had to send a baby off in essentially the same circumstances at the end of last season. So I think that's why they settled on him having to die, and the actor wanted it to be a death as a hero. I guess I do wonder when people are upset by things that happen on TV shows for *real life reasons* and not just creative choices by the show runner, how they would propose it be handled instead. because fans would not accept plots where Dolls had to suddenly leave on a mission of some sort and then just never be seen again. Maybe some fans wouldn't, but some would. I think I would have been fine with Dolls being written out as having to leave Purgatory to go keep watch over baby Alice indefinitely, especially if death was the only other option. That way they could bring him back for the series finale if they knew when it was coming and the actor was available. Depends on how real/intractable those real-life-reasons are, I guess? I mean, it's not like Shamier left on acrimonious terms or died over the hiatus and they had to write him out offscreen, so, I'm just disappointed that they thought death was the best way to go. My assumption is that Shamier Anderson was confident he would not ever return, and they didn't want any more loose ends when they've already ended up with a stupid loose end baby that they probably didn't really want or plan for.